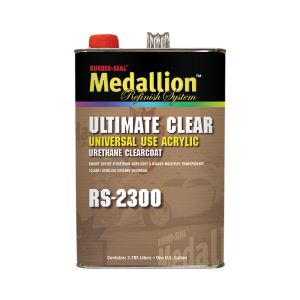 This acrylic-urethane clearcoat is suitable for single-panel or overall refinishing. Ultimate Clear is National Rule compliant and offers excellent gloss and durability. Excellent flow and leveling properties make this clearcoat user-freindly. It mixes 2:1:10% with RS-2200 series activators (RS-2260, RS-2275, RS-2285 and RS-2295) and RS-1800 series urethane reducers (RS-1860, RS-1870, RS-1885 and RS-1895). Available in gallons only.